The responsibility of a manager is to ensure that processes are followed correctly, but the responsibility of a leader is far more fundamental. By focusing on motivation, communication and team-building within the workforce, an effective leader can keep the entire team unified and driven towards a common goal. One of the biggest challenges to this endeavour comes when an employee begins suffering from a mental illness. This condition might not be immediately apparent, but with some understanding of the factors at play, the leader can learn to identify the key signs of depression at work – and make the appropriate adjustments to the work environment in order to relieve symptoms. Unlike many physical conditions and disabilities, mental illness in an employee can go unnoticed by colleagues and supervisors for long periods of time. If workplace anxiety and depression goes unaddressed, the resulting loss of productivity can disrupt job performance dramatically. Recent studies in the United States found that up to 15 million Americans suffer from these symptoms – significantly affecting their careers. 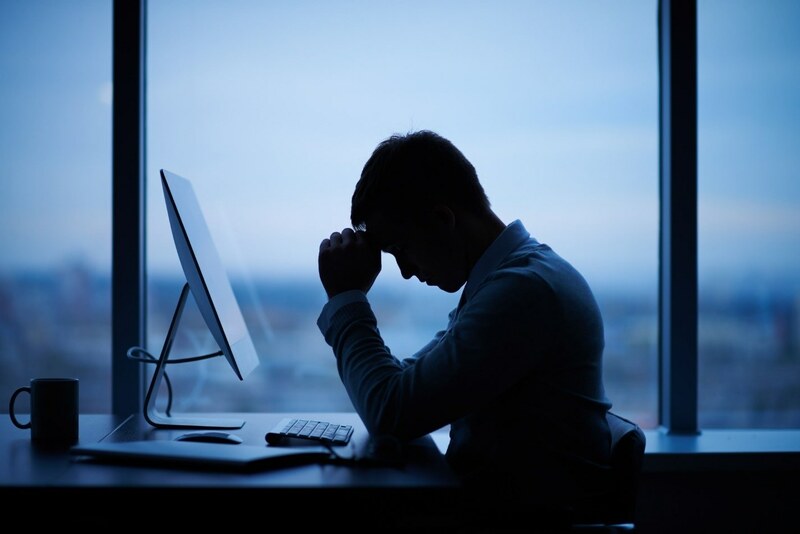 The Centers for Disease Control and Prevention (CDC) estimates that 200 million workdays are lost each year in the US due to depression alone, costing employers between $17 billion and $44 billion in productivity and insurance payments. Moreover, depression can easily affect company heads as well; a separate study found that nearly half of all entrepreneurs had personally suffered from depression. If several of these symptoms are observable for at least two weeks, it may be worth initiating a conversation about mental health. Note, however, that depression can manifest itself in a variety of ways, and a person may be suffering from its effects even if they do not display all of the symptoms listed above. As a general practice, the best way to monitor the mental health of your employees is to check in with them often, show sensitivity to their feelings, and create a safe environment for them to talk with you privately about any personal difficulties they may be having. Anxiety and depression are not the only issues to consider with regard to employees’ mental health. Post-traumatic stress disorder (PTSD), obsessive-compulsive disorder (OCD), attention deficit / hyperactivity disorder (ADHD), schizophrenia and other types of psychological issues can greatly interfere with job performance, while having a significant effect on the person’s quality of life as well. Responsible employers can take preventive measures to improve the work experience for their employees, while also listening to their concerns about additional issues which may be affecting their mental well-being. In many cases, an additional investment may be warranted to maximise employee health, happiness and productivity over the long term. Employee assistance programmes (EAPs) can be used to pay for outpatient counselling as well as short-term mental health retreats where workers can focus on their own mental well-being, and receive expert guidance on how to effectively deal with stressful thoughts and feelings as they arise. A well-organised EAP can also help provide lasting relief from debilitating conditions such as depression. Through personal consultation followed by a combination of therapy sessions and wellness activities, employees can strengthen their mental toolkit and recharge their emotional reserves. Such programmes may very well save employers money in the long run, as they tend to be cheaper than the cost of absenteeism or reduced productivity among those suffering from workplace anxiety and depression. EAPs are also, in most circumstances, far cheaper than the cost of replacing underperforming workers through new hires and the subsequent rounds of training that are needed to bring them up to speed. By taking good care of employees, organisations can hold on to their most experienced workers while also building a reservoir of goodwill across the team, as employees can then see that they will be taken care of if they run into similar difficulties. Located in Chiang Mai province, The Dawn is an excellent facility for businesses looking to provide their employees with mental health support. Through professional therapy sessions and a variety of calming physical activities, The Dawn offers an ideal environment for the rediscovery of inner peace. Clients receive personal care throughout their stay, along with mental training to help them deal effectively with their emotions in the future. For more on how we can help your employees successfully deal with depression, contact The Dawn today or call +66 63 048 4877.